The increasing incidence of sophisticated additive manufacturing applications means that better and more sophisticated material and bonding technologies are having to be developed in order to keep up. One recent example can be seen in Arevo of Silicon Valley, California, which has made a carbon-fibre framed bicycle. As the frame is made with a robot, there are low labour costs and the firm’s technology could enable the mass manufacture of composite frames. The start-up has raised $12.5m to commercialise its ‘digital additive manufacturing’ process. The company – which is led by early Amazon and Google executive Jim Miller – estimates it could make a bicycle frame for $300. Miller said he is in discussions with bike companies to “reshore” frame manufacturing from Asia to the US. Rather than layering strips by hand, Arevo’s technology involves a ‘deposition head’ printing out a 3D shape with strands of carbon fibre mixed with a thermoplastic bonding material. 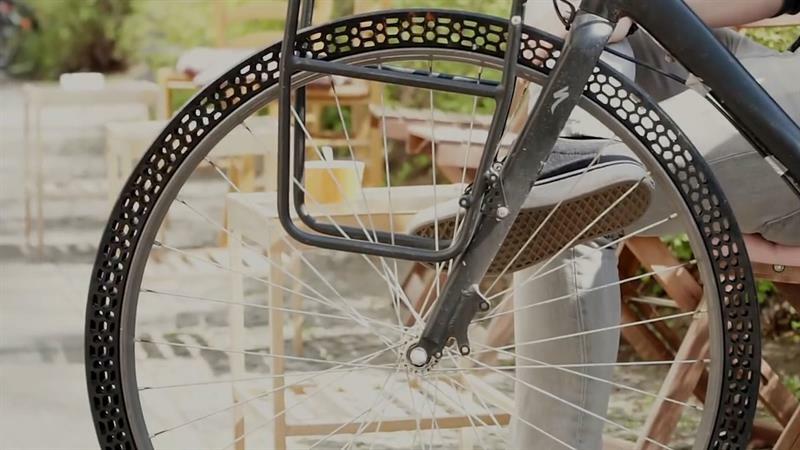 Also involving bicycles, Large-format 3D printer manufacturer, BigRep recently 3D printed the first airless bicycle tyre with the help of its TPU filament Pro FLEX. BigRep’s CEO Stephan Beyer says that beyond bicycles the material has incredibly broad potential: “We have expanded our technical portfolio with a high-impact, high-temperature-resistant material in Pro FLEX, which has higher interlayer-bonding than we have ever seen before, and robust chemical resistance for a range of technical applications. There is a clear use case for flexible parts that can be customised and printed on a needs basis, across med-tech, aerospace, automotive and other industries. The tyre was a prototype to demonstrate the ease and speed, as well as flexibility with which spare parts can be 3D printed. BigRep tested the bicycle tyre on the streets of Berlin as a part of its focus on industrial-grade solutions for the mobility industry. The tyre was printed to scale as a large 1:1 object on the BigRepONE 3D printer, which has a build volume of one cubic metre, without the need for gluing work or any other post-processing. Using FFF 3D printing, it can be a challenge to print with thermoplastic elastomers but with Pro FLEX, it is now possible to print larger flexible parts with strong print bed adhesion and without any issues from detachments. 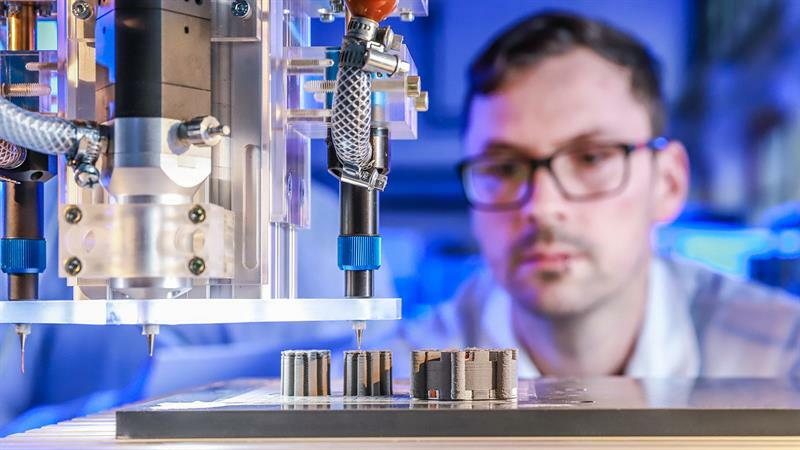 Meanwhile, another first has been achieved at the Chemnitz University of Technology, where researchers from the Professorship of Electrical Energy Conversion Systems and Drives have created the first fully 3D printed electric motor. Last year, two members of the Professorship, Johannes Rudolph and Fabian Lorenz, 3D printed a coil capable of withstanding temperatures over 300°C. In the time since then, they have 3D printed all of the components of an electric machine. That includes copper electrical conductors, which create magnetic fields in combination with iron or iron alloys and ceramic electrical insulation to insulate the conductors from each other and from the iron components. This is referred to as the magnetic circuit. The 3D printing process that the researchers developed for the motor involves the extrusion of viscous pastes which consist of particles of iron, copper or ceramics as well as specially-adapted bonding agents. The 3D printed part is then sintered, which burns away the binder and fuses the metallic or ceramic materials together. “Our goal over the last two and a half years was to dramatically increase the temperature that electrical machines are capable of withstanding,” said Dr. Ralf Werner, head of the Professorship. The researchers achieved this goal by replacing conventional polymer-based insulation materials with specialised ceramics, which have a much higher degree of temperature resistance. The ceramic insulation material also has a higher degree of thermal conductivity, so heat loss generated in the conductors can be more quickly dissipated. This allowed the researchers to increase the output density of electrical machines. “Despite the process-related decrease in the conductivity of the copper used, in specific application scenarios, it is possible to increase the degree of efficiency by significantly reducing the winding temperature,” says Lorenz. “The motor that was printed in the Chemnitz University Laboratory represents a breakthrough and is at the same time the proof of principle – it demonstrates the feasibility – of our technology,” says Rudolph.